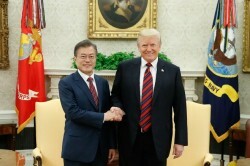 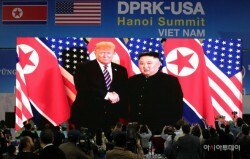 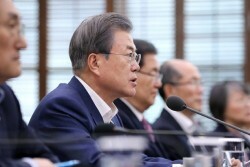 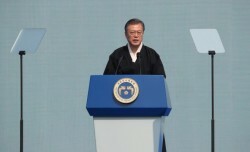 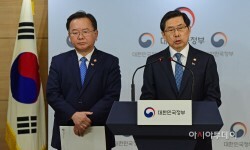 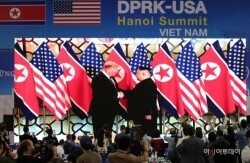 By AsiaToday reporter Heo Go-woon President Moon Jae-in and US President Donald Trump will hold a summit meeting in Washington on April 11. 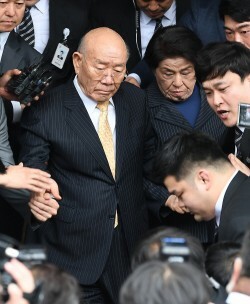 It will be..
By AsiaToday reporter Lim Yoo-jinRival parties clashed over their assessment of the recent confirmation hearings that wrapped up Wednesday for seven minist..
By AsiaToday reporters Hong Sun-mi & Ahn Jong-ho President Moon Jae-in urged the National Assembly on Monday to swiftly legislate work- and econom..
By AsiaToday reporters Hong Sun-mi & Ha Man-jooAs a war of nerves between the United States and North Korea is intensifying after the breakdown of the..
By AsiaToday reporters Heo Gyeong-joon & Kim Ji-hwanAs President Moon Jae-in ordered Monday a thorough investigation into the Burning Sun scandal and a..
By AsiaToday reporter Lim Yoo-jinPolitical parties on Monday clashed over fast-tracking an electoral reform bill to increase the number of proportional sea..
By AsiaToday reporter Heo Go-woon The United States and North Korea have been in a power struggle since the breakdown of the Hanoi summit. 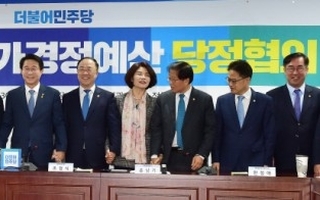 North Korea..
By AsiaToday reporter Lim Yoo-jinThe National Assembly on Wednesday passed eight bills related to fine dust, including relaxation of regulations on the use..
AsiaToday reporter Jo Jae-hyung North Korea and the United States are making little progress in narrowing their gaps on denuclearization and sanctions..
AsiaToday reporters Maeng Sung-kyu & Kim Ji-hwan Former President Chun Doo-hwan on Monday attended a libel hearing at the Gwangju District Court t..